North America is geographically enormous, yet unique in the fact that it only contains three nations (excluding Central America, of course). Canada, The United States of America, and Mexico are the three sovereign nations ruling over this large, western continent. Fortunately, the culinary traditions from each nation are unique and celebrated. I don’t think there is a town in the United States that doesn’t have a Mexican restaurant. And with American food so pervasive abroad, it is understandable that there are tools available to make it at home, no matter where that home is. Add to that the growing popularity of Canadian Poutine, and you have a strong and very diverse culinary scene! So if you are looking to bring some treats during your culinary travel of North America home with you, here are some tools that can help you to diversify your kitchen. The products are organized from North to South. Cold-water lobsters are a fantastic delicacy. With both Canadian and Maine lobsters so close by, lobster boils are popular in the great white North. This set of seafood forks and lobster claw crackers are all you need to have a rousing and successful lobster boil right in your own home. They are durable and dishwasher safe, and even come with a one-year limited warranty. So melt some butter, set up a giant pot, and enjoy some bright, fresh seafood at your own dining room table. Dropping a live lobster into a pot of boiling water may not be an easy thing to do. But once you taste the tender and aromatic lobster meat cracked from a bright red shell with the claw crackers that come with this kit, you won’t look back. Have you ever had real maple syrup? It is fantastic. One taste of some real Canadian maple syrup and you will never consume any other brand again. Real maple is expensive, but just try tapping a tree yourself and you will see just how much work goes into that little jar of liquid gold. With this kit you can tap the sugar maple trees you may be hiding right in your own backyard. The kit includes three metal buckets, three metal lids, a maple sugaring at home book, three spiles, a drill bit, and cheesecloth. One DIYer gave it a great review, stating that they were able to collect gallons and that the kit is great for beginners. It can be somewhat of a bummer to admit, but deep-fried foods are pretty quintessentially American. If you want to try and recreate McDonald’s French fries, attempt some onion rings, or make some deep fried chicken, then consider investing in this table-top deep fryer. It has a capacity of four liters and a temperature control dial that can be adjusted for faster frying. The removable basket is dishwasher safe (an invaluable feature for a home cook). Plus, the entire package comes with access to Club Chefman with recipes, video tutorials, and cookbooks. So set this up in your own home and recreate classic American junk food. You waist might regret it, but your tastebuds won’t! Another super-American dish is the humble s’more. When you combine a graham cracker, a chunk of Hershey’s milk chocolate, a marshmallow, and an open flame, magic happens. But just in case you don’t happen to have access to a fire-pit, invest in this flameless electric heater. The plate nestled around the steamer is actually a lazy Susan, and it can hold all of your s’more ingredients. With this little cooker, your family can enjoy this American camp favorite from the comfort of your own home. So learn some camp songs, forgo the bug spray, and have some more s’mores! 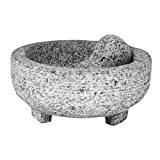 Whether you are grinding fresh spices or mixing up some fresh guacamole, a mortar and Pestle is an indispensable tool for the Mexican chef. This particular mortar and pestle has a large capacity (four whole cups) and can be used as a decorative piece when not in use. The smooth interior is an ideal grinding surface, and it is even dishwasher safe. The manufacturer even includes a fantastic guacamole recipe! You can mix up some fresh guac or dips, and leave them right in the dish for service. Invite some friends over and impress them all with your fantastic cooking skills. What is more Mexican than a bright and fresh street taco? And what is the base of any good taco? A fabulous tortilla! 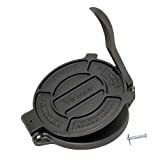 This tortilla press will help you press your own tortillas from the comfort of your own home. This pre-seasoned cast-iron skillet has a reinforced handle design, perfectly flat plates, and uses high-quality ingredients. This press manufacturer has been making 8-inch tortillas for more than 75 years. Nothing will taste more fresh, homey, rustic, and authentic than some homemade tortillas! So the next time you find yourself scheduling your week around taco Tuesday, stay home and make some fresh tacos. So whether you live stateside or abroad, making some authentic, North American foods from the three predominant cultures can be a fantastic experience. From North to South, satisfy your sweet tooth with some Canadian Maple Syrup, deep fry something that was once healthy for your American main, and snack on some chips and guac from Mexico. If you enjoyed this post, be sure to check out our culinary travel gadgets from Europe. Happy cooking!